Located in the heart of Colorado's Summit County, *Orofino by Straight Creek* truly provides year-round vacation activity! The resort is just minutes away from the ski areas of Copper Mountain, Arapahoe Basin, Keystone and Loveland. Lake Dillon and the Snake River offer a number of water sports. Golf, tennis and horseback riding can all be enjoyed nearby. 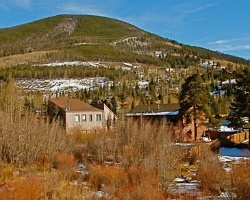 Ideal location with many year round activities available close by! Explore Colorado during week 12! Family friendly resort!